Ko, S. W., Tseng, Y. Y., Nieh, H. M., & Chang, C. Y. (2019, July). IT-assisted STEM curriculum- Basic electrical engineering and application of technology for science learning. Paper will be present at the 2019 the 3rd International Conference on Education and Multimedia Technology (ICEMT 2019), Nagoya, Japan. Chang, C. Y. (2019, April). CloudClassRoom (CCR), for the next generation. Paper presented at the Mobile Learning 2019 International Conference, Utrecht, The Netherlands. Lin, P. L., Nguyen K. T. T., Ko, S. W., Nguyen, V. H., Nguyen, V. B., & Chang, C. Y. (2019, March). New generation of STEM for new southbound countries: In-service teacher-training workshop between Taiwan and Vietnam. Poster presented at the 2019 Annual Meeting of the National Association for Research in Science Teaching (NARST), Baltimore, MD, USA. Lee, W. S., Lai, H. C., & Chang, C. Y. (2019, January). An Innovative design using ICT on outdoor education-AR-Integrated Learning Map (ARILM) applied in Barclay Community Park. Paper presented at the 2nd Eurasian Conference on Educational Innovation 2019 (ECEI 2019), Kent Ridge, Singapore. Cheng, P. H., Tsai, J. C., Chang, C. Y., & Chien, Y. H. (2019, January). Issue-problem based board game: Systemic learning environment for water resources sustainability. Paper presented at the 2nd Eurasian Conference on Educational Innovation 2019(ECEI 2019), Kent Ridge, Singapore. Tsai, J. C., Cheng, P. H., Liu, S. Y., & Chang, C. Y. (2019, January). Using board game to teach socio-scientific issues on biological conservation and economic development in Taiwan. Paper presented at the 2nd Eurasian Conference on Educational Innovation 2019(ECEI 2019), Kent Ridge, Singapore. Wahono, B. & Chang, C. Y. (2019, January). An assessment of attitude, knowledge, and application of STEM on science teachers: An effort to foster educational sustainability. Paper presented at the 2nd Eurasian Conference on Educational Innovation 2019 (ECEI 2019), Kent Ridge, Singapore. Liou, W. K. & Chang, C. Y. (2019, January). Handheld wireless 2D to 3D image projection teaching system. Paper presented at the 2nd International Conference on Electronics, Computer Engineering and Electrical Engineering (ECEEE-2019), Osaka, Japan. Chen, S. Y., Tsai, J. C., Liu, S. Y., & Chang, C. Y. (2018, November). Just a Game? Developing Students’ Conception in Chemistry and Problem-solving Skills through the Board Game. Paper presented at the International Conference of East-Asian Association for Science Education (EASE 2018), Hualien, Taiwan. Tsai, J. C., Chen, S. Y., Liu, S. Y., & Chang, C. Y. (2018, November). Development and Application of Biodiversity Science Board Game. Paper presented at the International Conference of East-Asian Association for Science Education (EASE 2018), Hualien, Taiwan. Nguyen K. T. T., Lin, P.L. & Chang, C. Y. (2018, November). Teachers’ Acknowledgement and Perception toward STEM Education in Vietnam: Empirical Exploration. Paper presented at the International Conference of East-Asian Association for Science Education (EASE 2018), Hualien, Taiwan. Nguyen K. T. T., Lin, P.L.& Chang, C. Y. (2018, November). Pre-Service Teachers’ Conceptions of STEM Education in Vietnam. Paper presented at the International Conference of East-Asian Association for Science Education (EASE 2018), Hualien, Taiwan. Bevo Wahono. & Chang, C. Y. (2018, November). Examining the Relationship between Science Teachers’ Knowledge, Attitude, and Application of STEM Education. Paper presented at the International Conference of East-Asian Association for Science Education (EASE 2018), Hualien, Taiwan. Martin, S. N., Chien, Y. T., Jen, C. H., Chang, C. Y., Chu, H. E., Kesting, J,...Faisal, S. (2018, November). Comparative Analysis of Students’ Engagement and Participation in Classroom Science (EPIC-S) from Taiwan, Thailand, Korea, and Indonesia. Paper presented at the International Conference of East-Asian Association for Science Education (EASE 2018), Hualien, Taiwan. Chang, C. Y. & Liou, W. K. (2018, October). The impact of a digital interactive globe system on students' learning outcomes. Paper presented at the Australian Geoscience Council Convention (AGCC 2018), Adelaide, Australia. Wu, L. Y., Li, P. S., & Chang, C. Y. (2018, April). Insights from a brand new cooperation model: Science Edu-communication through frame analysis of the project Different Science News in Taiwan. Paper presented at Public Communication of Science and Technology Conference (PCST 2018), Dunedin, New Zealand. Chien, Y. T., Jen, C. H., Martin, S. N., Chu, H. E., & Chang, C. Y. (2018, March). Factors Contributing to Student Participation in Science Classroom: A Survey Study. Paper presented at the 2018 Annual Meeting of the National Association for Research in Science Teaching (NARST), Atlanta, USA. Lin, J., Liu, X. F., Chang, C. Y., & Sun, T. (2018). Investigation on the Professional Ethics of Science Teachers in China's Primary and Middle Schools. Paper presented at the 2018 Annual Meeting of the National Association for Research in Science Teaching (NARST), Atlanta, USA. Tutwiler, M. S., Lin, M. C., & Chang, C. Y. (2018, March). Gender Differences in the Engagement and Knowledge Gains of Students using a Virtual Field Trip. Paper presented at the 2018 Annual Meeting of the National Association for Research in Science Teaching (NARST), Atlanta, USA. Liou, W. K. & Chang, C. Y. (2018, February). Virtual Reality Classroom Applied to Science Education. Paper presented at the 23rd International Scientific-Professional Information Technology Conference 2018 (IT 2018), Zabljak, Montenegro. Chang, C. Y. (2017, December).Taiwanese Literacy-oriented Curriculum Reform: Past, Present and the Possible Future. Paper presented at the 2017 SNU-HU-NTNU-KU joint symposium for Science Education, Hokkaido, Japan. Lee, L. C., Cho, Y. C., Huang, H. Y., Chang, C. Y. *, & Yeh, T. K.* (2017, September). Genetic variants of the NMDAR subunits influence on receptor properties and associate with synaptic plasticity. Poster presented at XXIII World Congress of Neurology, Kyoto, Japan. Jen, C.H., Chien, Y.T., Martin, S. N., Chu, H.E., & Chang, C. Y. (2017, August). Student participation and perception of social environment in the science classroom. Paper presented at the European Science Education Research Association (ESERA) 2017 International Conference, Dublin, Ireland. Liou, W. K. & Chang, C. Y. (2017, August). Low-Cost 3D Virtual Reality System Applied to Science Education. Poster presented at the 2017 International Conference on Education, Psychology,and Learning (ICEPL 2017), Sapporo, Japan. Bhagat, K.K., Chang, C. Y., & Huang, R. (2017, July). Integrating GeoGebra with TPACK in improving Pre-service Mathematics Teachers’ Professional Development. Paper presented at the 17th IEEE International Conference on Advanced Learning Technologies - ICALT2017, Timisoara, Romania. Chang, C. Y. (2017, Febuary). ECNG (Education, Cognition, Neuron, and Gene): An Interdisciplinary Research Framework. Poster presented at the International Journal of Arts & Sciences (IJAS), Valletta, Malta. Jen, C. H., Chien, Y. T., Martin, S. N., Chu, H. E., & Chang, C. Y. (2017, February). Who talks less in science? Exploring factors mediating the relationship between students’ social interaction anxiety and verbal participation in class. Poster presented at the Korean Association for Science Education (KASE), Seoul, Korea. Chien, Y. T., Lee, Y. H., Jen, C. H., Martin, S. N., & Chang, C. Y. (2017, February). Investigating interaction effects between clicker usage and student participation preferences on physics learning outcomes. Paper presented at the Korean Association for Science Education (KASE), Seoul, Korea. Liou, W. K., Bhagat, K. K., & Chang, C. Y. (2016, November). A Digitally Interactive Globe System(DIGS) Embedded into Earth Science Courses. Poster presented at the EAPRIL Conference 2016, Porto, Portugal. Ahn, W., Chu, H. E., Martin, S. N., Chien, Y. T., Jen, C. H., & Chang, C. Y. (2016, August). Development of an instrument to examine Engagement and Participation in Classroom-Science (EPIC-S). Paper presented at the International Conference of East-Asian Association for Science Education (EASE 2016), Tokyo, Japan. Chien, Y. T., Jen, C. H., Martin, S. N., Ahn, W., & Chang, C. Y. (2016, August). Toward an understanding of students' verbal and non-verbal participatory in the science classroom. Paper presented at the International Conference of East-Asian Association for Science Education (EASE 2016), Tokyo, Japan. Wu, P. H., Wu, L. Y., & Chang, C. Y. (2016, August). Science Edu-communication: An exploration of the impact of science education initiated television news on learners’ perceived Awareness, Enjoyment, Interest, Opinion Formation, and Understanding (AEIOU). Paper presented at the International Conference of East-Asian Association for Science Education (EASE 2016). Session of Science Communication & Engagement, Tokyo, Japan. Liu, H. H., Wu, L. Y., Chang, C. Y., & Chien, Y. H. (2016, August). Role-playing of science news production: An innovative approach of science teaching to develop information searching, oral and visual presentation skills in Taiwanese junior high school. Paper presented at the International Conference of East-Asian Association for Science Education (EASE 2016), Tokyo, Japan. Chen, P. C., Wu, L. Y., Chang, C. Y., & Chien, Y. H. (2016, August). An exploration of game-based learning in senior high school chemistry classroom－ An action research approach. Paper presented at the International Conference of East-Asian Association for Science Education (EASE 2016), Tokyo, Japan. Wu, L. Y., Chang, H., Liang, W. T., Chen, K. H., & Chang, C. Y. (2016, July). Development and validation of citizen seismological literacy (CSL) in Taiwan. Paper presented at the Asia Oceania Geosciences Society (AOGS 2016), Session of Accelerating Citizen Geoscience: Intersection of Social Media, Innovative Technology, Scientific Research, and Outreach, Beijing, China. Liou, W. K. & Chang, C. Y. (2016, July). Smart-Clothing Teaching Mode Applied to Science Education. Poster presented at the International symposium on Teaching, Education, and Learning(ISTEL 2016), Nagoya, Japan. Lee, L. C., Su, M. T., Cho, Y. C. Lee-Chen, G. J.,Yeh, T. K.* and Chang, C. Y. (2016, July). Homeostatic microRNAs and MeCP2 epigenetic regulators are associated with learning and memory. Poster presented at the 10th FENS Forum of Neuroscience, Kopenhagen, Denmark. Chen, C. L. D., Chang, Y. H., & Chang, C. Y. (2016, June). Research Trends on Information and Communication Technology: An Automatic Content Analysis from 1996 to 2015. Poster presented at the European Conference on Technology in the Classroom (ECTC 2016), Brighton, United Kingdom. Bhagat,K.K., Liou, W. K., & Chang, C. Y. (2016, April). Highly Interactive Cloud-Classroom (HIC) embedded into Undergraduate Chemistry Course. Poster presented at the 2016 Annual Meeting of the National Association for Research in Science Teaching (NARST), Baltimore, MD, USA. Chang, C. Y. & Chien, Y. T. (2016, January). A practical model to develop pre-service teachers' capability for mobile teaching. Paper presented at the International Conference on Mobile Technology in Teach Education(MiTE 2016), Galway, Ireland. Liou, W. K. & Chang, C. Y. * (2015, August). Interactive 3D Virtual Reality System Applied to Millitary Training. Poster presented at the Conference of Emerging Technologies in Authentic Learning Contexts within Higher Vocational Education, Cape Town, South Africa. Bhagat, K. K., Jen, T. H., & Chang, C. Y. * (2015, August). Student’s Perceptions towards Online Learning: A Cross-Country analysis. Paper presented at the European Science Education Research Association (ESERA) 2015 International Conference, Helsinki, Finland. Liou, W. K. & Chang, C. Y. * (2015, August). Invention interactive 3D simulated-globe system embedded in Earth Science and Geography courses. Paper presented at the International Symposium on Teaching, Education, and Learning - Summer Session (ISTEL 2015-Summer), Fukuoka, Japan. Chien, Y. T., Chang, C. Y., Lee, Y. H., Li, T. Y. & Eizo Ohno (2015, July). Investigating How Students Use Voting Results Aggregated by Clickers to Participate in Peer Discussion. 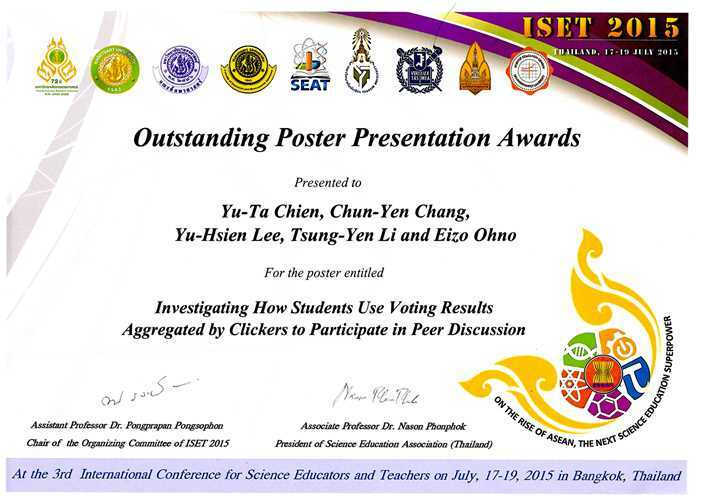 Poster presented at the 3rd International Conference of Science Educators and Teachers (ISET 2015), Bangkok, Thailand. This paper won the Outstanding Poster Presentation Award. Chang, C. Y. * & Chien, Y. T. (2015, June). Development and Evaluation of a Course Model to Prepare Teachers in Mobile-AssisteD-teaching (MAD-teaching). Paper presented at the 2nd International KES Conference on SMART EDUCATION AND E-LEARNING KES-SEEL-15, Sorrento, Italy. Chien, Y. T., & Chang, C. Y. * (2015, April). Developing a framework to understand how students participate in clicker-integrated activities: Focusing on framing. Poster presented at the International Conference of Education in Mathematics, Science, and Technology (ICEMST), Antalya, Turkey. Chang, C. Y. *, & Chien, Y. T. (2015, April). Block voting in the clicker-integrated classroom: Interaction between students’ prior knowledge, clicking behaviors, and conceptual learning outcomes. Paper presented at the Conference of Education in Mathematics, Science, and Technology (ICEMST), Antalya, Turkey. Chien, Y. T., Li, T. Y., & Chang, C. Y. * (2015, April). Does displaying the real-time voting results affect students' conceptual learning outcomes in clicker-integrated science classrooms? Paper presented at the Annual Meeting of the National Association for Research in Science Teaching (NARST), Chicago, Illinois, USA. Chien, Y. T., & Chang, C. Y. * (2015, April). Providing students with an alternative way to interact with the teacher in the silent classroom: Teaching with the CloudClassRoom technology. Paper presented at the Inaugural Asian Conference on Education & International Development (ACEID) 2015, Osaka, Japan. Bhagat, K. K., & Chang, C. Y. * (2015, March). Beyond Flipped Classroom: A Highly Interactive Cloud-Classroom (HIC) embedded in Basic Materials Science Course. Paper presented at the International Joint Seminar and Research Camp program on Natural Sciences (JSRC2015), Niigata, Japan. Bhagat, K. K., & Chang, C. Y. * (2014, November). Application of Augmented Reality (AR) Technology in learning Science concepts. Paper presented at the International Science Education Conference 2014 (ISEC 2014 Singapore), Singapore. Bhagat, K. K., & Chang, C. Y. * (2014, November). Visualizing projectile motion using dynamic mathematical software: GeoGebra. Paper presented at the International Science Education Conference 2014 (ISEC 2014 Singapore), Singapore. Chang, C. Y. *, Chien, Y. T., & Li, T. Y. (2014, October). A web-based instant response system to support college-level science teaching. Paper presented at the 2014 world conference of the International Society of Educational Research (iSER), Cappadocia, Turkey. Chien, Y. T., & Chang, C. Y. * (2014, October). To display or not to display: Does displaying the voting results affect students’ conceptual learning outcomes in a clicker-integrated science classroom? Paper presented at the Sixth Asian Conference on Education (ACE), Osaka, Japan. Liou, W. K. & Chang, C. Y. * (2014, October). New Flipped Classroom with Sil( Self Interactive Learning) & Ccr(Cloud Classroom) Technology. Paper presented at the “The Asian Conference on Society, Education & Technology” (ACSET 2014) & “The Asian Conference on Education”(ACE 2014), Osaka, Japan. Chang, C. Y. * & Liou, W. K. (2014, August). The Impacts of Innovative Technologies on Students' Learning of Basic Material Science Knowledge, The 15th IUMRS-International Conference in Asia (IUMRS-ICA 2014), Fukuoka, Japan. Bhagat, K. K., & Chang, C. Y. * (2014, July). Incorporating GeoGebra into Geometry learning-A lesson from India. Paper presented at the Annual Meeting of the Australian Science Education Research Association (ASERA), Melbourne, Australia. Chien, Y. T., Li, T. Y., & Chang, C. Y. * (2014, April). Integration of instant response system with automatic group-formation techniques to support socio-scientific argumentation in the classroom. Paper presented at the 2014 Asian Conference on Technology in the Classroom (ACTC), Osaka, Japan. Li, T. Y., Chien, Y. T., & Chang, C. Y. * (2014, April). Developing a cross-platform instant response system to facilitate group discussions in the classroom. Paper presented at the 2014 Asian Conference on Technology in the Classroom (ACTC), Osaka, Japan. Liou, W. K.* & Chang, C. Y. (2014, April). A New Interactive Whiteboard technologies application in classroom – Brand new LaDIS (Laser Driven Interative System) Prezi Presenter. Poster presented at the The Asian Conference on Technology in the Classroom(ACTC 2014), Osaka, Japan. Chien, Y. T., Lo, W. S., & Chang, C. Y. (2013, September). For whom is the use of animations better than static graphics to present science test questions. Paper presented at the European Science Education Research Association (ESERA) 2013 International Conference, Nicosia, Cyprus. Chiang, C. Y., Lin, M. C., Chang, C. Y. (2013, September). Embodying gesture-based multimedia to enhance learning – A Study of the cloud family. Paper presented at the European Science Education Research Association (ESERA) 2013 International Conference, Nicosia, Cyprus. Liou, W. K. & Chang, C. Y*. (2013, July). The Application of VLE with 3D Google Earth and Interactive Technology. Poster presented at the 8th International Conference on Software Engineering and Applications (ICSOFT-EA 2013), Reykjavík, Iceland. Chang, Y. H., Tutwiler, M. S., Chen, T. Y., & Chang, C. Y. (2013, July). Teachers’ teaching practice and the relationships with teaching beliefs and confidence in science courses. Paper presented at the Inaugural European Conference on Education (ECE), Brighton, UK. Chen, C. L. D., Lin, W. Y., Lo, W. C., Chang, Y. H., Wang, C. Y., Lu, C. H., Chang, C. Y. (2013, July). Exploring students' preferences in inquiry-based learning and the possible factors that influence students' learning outcomes and in a reformed science classes. Paper presented at the Inaugural European Conference on Education (ECE), Brighton, UK. Lin, M. C., Kao, L. Y., & Chang, C. Y. (2013, July). Changing the way student see and interact with the world via Augmented Reality technology. Paper presented at the Inaugural European Conference on Technology in the Classroom (ECTC), Brighton, UK. Chien, Y. T., Li, T. Y., & Chang, C. Y. (2013, July). Cloud Clickers: A cross-platform instant response system to increase classroom participation. Poster presented at the Inaugural European Conference on Technology in the Classroom (ECTC), Brighton, UK. Lin, C. F., Chang, C. Y. (2013, July). Case study of Embedded Assessment Integration into Informal Science Learning on Astronomy education activities. Paper presented at International Conference of The East-Asian Association for Science Education (EASE), Hong Kong Institute of Education, Hong Kong, China. Cheng, J. Y. S., Chan, W. P., Ho, P. S., Liu, H. L., & Chang, C. Y. (2013, April). Neural correlates of mathematics competence in children: A functional MRI study. Paper presented at The 21st annual meeting of the ISMRM, Salt Lake City, Utah., USA. Chang, C. Y., Chien, Y. T., Lin, M. C., Chang, Y. H., & Chen, C. L. (2012, December). Initiating a new model to prepare teachers in Mobile‐AssisteD‐teaching (MAD‐teaching). Paper presented at the Annual International Conference of the Association of Science Education (ASET), Taipei, Taiwan. Chang, Y. H., Tutwiler, M. S., Chang, C. Y. (2012, December). Exploring the relationship between teacher beliefs, confidence, and practice in a curriculum reform program. Paper presented at the Annual International Conference of the Association of Science Education (ASET), Taipei, Taiwan. Chang, C. Y., & Chen, C. L. D. (2012, December). 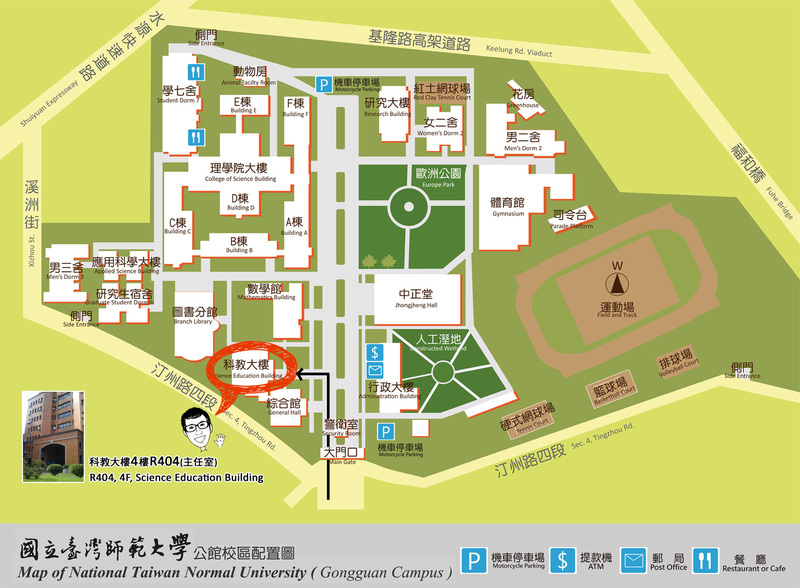 Innovating science teaching and learning through an integrated effort at National Taiwan Normal University. Paper presented at the Annual International Conference of the Association of Science Education (ASET), Taipei, Taiwan. Chen, C. L. D., Chang, Y. H., Tseng, Y. H., Chang, C. Y. (2012, November). Trends of ICT research: An automatic content analysis of publications in selected journals from 2001 to 2010. Paper presented at the international conference of European Association for Practitioner Research on Improving Learning (EAPRIL), Jyvaskyla, Finland. Chang, Y. H., Tseng, Y. H., Chang, C. Y., & Chen, C. L. D. (2012, November). Research trends of pedagogical content knowledge: An automatic content analysis. Paper presented at the Annual International Conference of the European Association for Practitioner Research on Improving Learning (EAPRIL), Jyvaskyla, Finland. Chien, Y. T., Wu, H. C., & Chang, C. Y. (2012, November). Gender differences in earth science achievement testing: Does visualization modality matter? Paper presented at the Annual International Conference of the European Association for Practitioner Research on Improving Learning (EAPRIL), Jyvaskyla, Finland. Tseng, Y. H. and Chang, C. Y. (2012, September). Performance Comparison for Educational Institutes –Identifying Sub-Field Characteristics by Journal Clustering for Better Ranking. Paper presented at the 2012 Science and Technology Conference, Montreal, Quebec, Canada. Yang, C., Yeh, T. K., Chang, C. Y. (2012, March). Exploring the Impact of Animation-based Genetic Instruction on Students' Perceived Cognitive Load and Learning Outcomes. Paper presented at National Association of Research in Science Teaching (NARST), Indianapolis, Indiana, USA. Chien, Y. T., & Chang, C. Y. (2012, March). An animation-based approach to clarify the meanings of questions in a technology-enhanced science learning environment preference questinnaire. Paper presented at the Annual Meeting of the National Association for Research in Science Teaching (NARST), Indianapolis, Indiana, USA. Lin, M. C., Tutwiler, M. S., and Chang, C. Y. * (2012, March). Virtual Learning Environment Preference, Perception of Helpfulness, and Achievement in Taiwanese Earth Science Students. Paper presented at theNational Association of Research in Science Teaching (NARST), Indianapolis, Indiana, USA. Liang, W. T., Lin, C. Y., Yen, E., Chen, H. K., Chang, C. Y., Chen, H. Y., & San, W. (2012, February). Toward a Taiwan School Seismic Network through QCN-Taiwan. Paper presented at the International Symposium on Grids & Clouds (ISGC) 2012, Taipei, Taiwan. Lin, P. L., Tseng, Y. H., Liu, H. H., & Chang, C. Y. (2012, April). What The Media Wants Us to Believe: Investigating Taiwan Media Attitudes Towards Nanotechnology, Suggestion. Paper presented at the PCST 2012, Florence, Italy. This paper won the financial support from the Centre for Environmental Law Decisions (CIGA) of the University of Padua. Hagmann, J.-G., Chang, C. Y., Palumbo J. (2012, February). A Digital Platform for Learning and Sharing: The Development of the Open Science Resources Portal. Paper presented at The American Association for the Advancement of Science (AAAS) Annual Meeting, Vancouver, Canada. Lin, M. C. and Chang, C. Y. * (2011, September). Applications of the 3DVR Learning Environment for Field Trip. Paper presented at the European Science Education Research Association (ESERA), Lyon, France. Chang, C. Y., Liu, Y. L., Chien, K. K., & Chang, Y. H. (2011, November). High-Scope Curriculum Program in Taiwan. Paper presented at the NTNU-HU-SNU Joint Symposium on Science Education, Taipei, Taiwan. Cheng, J. Y. S.*, Chang, C. Y. (2011, August). The Design of New Teaching Model of Neuroanatomy to Prevent Neurophobia in Preclinical Medical Students. Poster presented at The Association for Medical Education in Europe (AMEE) annual conference, Vienna, Austria. Lin, P. L., Chang, C. Y. (2011, June). Investigating Scientific Literacy in Media (SLiM) between different genders, Suggestion. Paper presented at the ASERA 2011 International Conference, Adelaide, Australia. Lin, C. Y., Chang, C. Y. *, Fu, H. H., Huang, S. T. (2011, June). Developing and Validating a Science Activity-based Learning Environment (SALE) Instrument for the High Scope Program in Taiwan. Paper presented at the Australasian Science Education Research Association Ltd (ASERA) International Conference, Adelaide, Australia. Lin, P. L., Chang, C. Y. (2011, September). Relation between academic achievement and self-concept among Asian gifted student in earth science. Paper presented at the European Science Education Research Association (ESERA) International Conference, Lyon, France. Chen, C. L. D., Chang, C. Y., & Shiong, S.Y. (2011, September). The impacts of game-based learning and test anticipation on students' learning outcomes in Geology. Paper presented at the European Science Education Research Association (ESERA) International Conference, Lyon, France. Chang, Y. H., Chang, C. Y., & Chen, T. Y. P. (2011, September). Catalysts for school change in a high school-led curriculum reform partnership. Paper presented at the European Science Education Research Association (ESERA) International Conference, Lyon, France. Chen, C. L. D., Chang, Y. H., & Chang, C. Y. (2011, June). New technology to meet students' learning needs: A future smart university classroom in Taiwan. Paper presented at The Australasian Science Education Research Association Ltd (ASERA) International Conference, Adelaide, Australia. Chien, Y. T., & Chang, C. Y. (2011, June). Exploring the feasibility of the MAGDAIRE model to assist pre-service science teachers in learning technology integration. Paper presented at The Australasian Science Education Research Association Ltd (ASERA) International Conference, Adelaide, Australia. Chang, C. Y., & Chang, Y. H. (2011, June). Does high school + university = scientific literacy? Paper presented at The Australasian Science Education Research Association Ltd (ASERA) International Conference, Adelaide, Australia. Chang, C. Y., & Cho, C. W. (2011, May). Incorporating online informal science learning resources into formal science learning environments in Taiwan. Paper presented at Ecsite Annual Conference 2011, Warsaw, Poland. Chien, Y. T., & Chang, C. Y. (2011, April). Leveraging on interactive animation to facilitate student science-process skill learning. Paper presented at the Annual Meeting of the National Association for Research in Science Teaching (NARST), Orlando, FL, USA. Chen, C. L. D., Chang, Y. H., & Chang, C. Y. (2011, April). Innovative information and communication technology systems to facilitate student learning: A smart university classroom in Taiwan. Paper presented at the Annual Meeting of the National Association for Research in Science Teaching (NARST), Orlando, FL, USA. Lin, P. L., Chang, C. Y. (2010, July). The impact of watching TV news on children’s Scientific Literacy in Media (SLiM), Suggestion. Paper presented at the IAMCR 2010, Braga, Portugal. Yeh, T. K.*, Chang, C. Y., Hu, C.Y., Li, R. H., Cheng, C. T., Chen, M. C., Li, & C. H. (2010, May). Examining for association between candidate gene polymorphisms in the dopamine pathway and academic achievement in a Chinese cohort. Paper presented at Association for Psychological Science (APS) 22th Annual Convention, Boston, USA. Chang Rundgren, S. N., Rundgren, C.-J. & Chang, C. Y. (2010, June). Comparing Swedish senior high and undergraduate students’ scientific literacy in media (SLiM) regarding biological terms. Paper presented at ICASE, Tartu, Estonia. Chang Rundgren, S. N., Rundgren, C.-J. & Chang, C. Y. (2010, June). Are you SLiM from a biological perspective? -- Evaluating scientific literacy in media regarding biological terms. Paper presented at ERIDOB, Braga, Portugal. Lin, P. L., Chang, C. Y. (2010, January). Investigating Scientific Literacy in Media (SLiM) among different media usage groups. Paper presented at 6th International Conference on Science, Mathematics, and Technology Education, Hualien, Taiwan. Chang, C. Y., Chen, C.-L.D., & Chang, Y. H. (2010, January). Evaluation of a school-based science curriculum development initiative: The Sci-Tech Mind and Humane Heart Project. Paper presented at the 6th International Conference on Science, Mathematics and Technology Education (SMTE), Hualien, Taiwan. Tsao, H. J., Lin, K. H., Cheng, C. T., Tsai, P. H., Huang, Y. K, Chang, Y. H., & Chang, C. Y. (2010, January). Action research in a high school initiated partnership: Catalysts for teacher development and school change. Paper presented at the 6th International Conference on Science, Mathematics and Technology Education (SMTE), Hualien, Taiwan. Chou, T. Y., Yeh, T. K., & Chang, C. Y. (2010, January). Using implicit association test to measure students’ implicit attitudes toward environmental protection. Paper presented at 6th International Conference on Science, Mathematics, and Technology Education (SMTE), Hualien, Taiwan. Chang, C. Y., Chang, Y. H., & Chen, C. L. D. (2009, May). Time for hazard mitigation curriculum? An implementation study conducted in the senior high school. Paper presented at the 2nd International Conference on Education for Disaster Prevention (ICEDP) 2009, Yunlin, Taiwan. Lin, M. C. & Chang, C. Y. (2009, June). Incorporating auto-grading and feedback tools into an online 3D Compound Virtual Field Trip system. Paper presented at the ED-MEDIA World Conference on Educational Multimedia, Hypermedia & Telecommunications, Honolulu, HI ,USA. Chang, Y. H., Chang, C. Y. *, & Chen, C. -L. D. (2009, August). Technology for pedagogy in smart classroom: A qualitative case study in an undergraduate earth science course. Paper presented at the European Science Education Research Association (ESERA) International Conference, Istanbul, Turkey. Chang, Y. H., & Chang, C. Y. * (2009, April). Earth Science Faculty’s Collaborative Pedagogical Practice and Professional Image in an Introductory Earth Science Teacher Education Course. Paper presented at National Association of Research in Science Teaching (NARST), Orange County, Garden Grove, USA. Chou, T. Y., Wang, H. C., Yeh, T. K., & Chang, C. Y. * (2009, April). Measuring students’ implicit attitudes toward environmental protection. Paper presented at National Association of Research in Science Teaching (NARST), Orange County, Garden Grove, USA. Chang, C. Y. * (2009, August). Students’ learning environment perception gaps in a reform college earth science course in Taiwan. Paper presented at the European Science Education Research Association (ESERA) International Conference, Istanbul, Turkey. Chang, C. Y. *, Lin, M. C., Hsiao, C. H. (2009, July). 3D Compound Virtual Field Trip System and its Comparisons with an Actual Field Trip. Paper presented at Ninth IEEE International Conference on Advanced Learning Technologies, Riga, Latvia. Hsiao, C. H., Chang, C. Y., & Yeh, T. K. (2008, August). Exploring student metal model of the real moon motion trajectory relative to the sun. Paper presented at International Geological Congress (IGC) 33rd Session, Oslo, Norway. Chang, C.Y., & Hsiao, C. H. (2008, August). College science students’ preferred-actual learning environment in a reform introductory earth science course. Paper presented at International Geological Congress (IGC) 33rd Session, Oslo, Norway. Yeh, T. K., Hu, C.Y., & Chang, C. Y. (2008, May). Exploring possible associations between students’ genetic polymorphism and their cognitive abilities. Paper presented at Association for Psychological Science (APS) 20th Annual Convention, Chicago, USA. Lin, M. C., & Chang, C. Y. * (2008, March). The application of the 3D virtual reality on field trip: Taking the Example of Hsiaoyukeng. Paper presented at the Annual Meeting of the National Association for Research in Science Teaching, Baltimore, MD, USA. Huang, C. C., Chang, C. Y. *, Li, T. Y., &Wang, H. C. (2008, March). A collaborative support tool for problem-solving ability: Idea storming cube. Paper presented at the Annual Meeting of the National Association for Research in Science Teaching, Baltimore, MD, USA. Jen, T. H., Lee, C. D., & Chang, C. Y. * (2008, March). The effects of different science-subject achievements on self-concept in science learning - Are they same for 8th graders in Taiwan? Paper presented at the Annual Meeting of the National Association for Research in Science Teaching, Baltimore, MD, USA. Wu, Y. T., Tsai, C. C., & Chang, C. Y. * (2008, March). High school students' scientific epistemological beliefs, cognitive structures regarding nuclear power usage, and their informal reasoning on the debates of nuclear power usage. Paper presented at the Annual Meeting of the National Association for Research in Science Teaching, Baltimore, MD, USA. Wang, H. C., & Chang, C. Y. * (2008, February). Assessing creative problem solving with automated text grading. Paper presented at the Conference of Asian Science Education, Kaohsiung, Taiwan. Lee, M. H., Chang, C. Y. *, & Tsai, C. C. (2008, February). Exploring Taiwanese high school students' perceptions regarding teacher authority in science classroom with relations to their attitudes and achievement. Paper presented at the Conference of Asian Science Education, Kaohsiung, Taiwan. This paper won the Springer Best Paper Award at the CASE 2008. Chang, C. Y., Chen, Y. C., & Yeh, T. K. (2007, December). Research on the development of hazards-mitigation related teaching resources and outreach program in the secondary school. Poster presented at 2007 International Symposium on Education Disaster Prevention, Taipei, Taiwan. This paper won the Outstanding Poster Award. Wang, H. C., Rose, C. P., Cui, Y., Chang, C. Y. *, Huang, C. C., & Li, T. Y. (2007, July). Thinking hard together: The long and short of collaborative idea generation in scientific inquiry. Paper presented at the 7th Computer Supported Collaborative Learning conference (CSCL), New Brunswick, New Jersey, USA. (NSC 95-2524-S003-012)This paper was nominated for a Best Student Paper award. Liang, J. C., Tsai, C. C., & Chang, C. Y. * (2007, April). The development of science activities via online peer assessment: The role of scientific epistemological views. Paper presented at the Annual Meeting of the National Association for Research in Science Teaching, New Orleans, LA, USA. Wu, Y. T., Tsai, C. C., & Chang, C. Y. * (2007, April). The relationships between high school students' cognitive structures regarding nuclear power and their informal reasoning on nuclear power usage. Paper presented at the Annual Meeting of the National Association for Research in Science Teaching, New Orleans, LA, USA. Huang, C. C., Li, T. Y., Wang, H. C., & Chang, C. Y. * (2007, March). Idea storming cube: A game-based creative thinking support system. Poster presented at the First IEEE International Workshop on Digital Game and Intelligent Toy Enhanced Learning, Jhongli, Taiwan. (DIGITEL 2007) (NSC 95-2524-S003-012) This paper was nominated for the Best Poster Award. Lin, M. C., Chang, C. Y. *, & Yieng, C. F. (2006, May). Pioneering the impacts of virtual field trip and related factors on students’ learning achievement. Full paper (only 25%, 62/244, was accepted in this category) presented at the 11th Global Chinese Conference of Computers in Education(GCCCE), Guangzhou, China.. (NSC 94-2524-S003-014)This paper was awarded the Best Student Paper. Trend, R., Chang, C. Y. & Orion, N. (2006, September). Deep time project: Understanding of geological time across societies. Workshop presented at the Fifth International Conference on Geoscience Education (GeoSciEd V), Bayreuth, Germanty. Wang, H. C., Rosé, C. P., Li, T. Y., & Chang, C. Y. * (2006, March). Providing support for creative group brainstorming: taxonomy and technologies. Workshop presented at the 8th International Conference on Intelligent Tutoring Systems, Jhongli, Taiwan (ITS 2006) (NSC 94-2524-S003-014). Chang, C. Y. * (2005, April). Standards and textbooks for grades 1-9 science and life technology curriculum in Taiwan. A paper presented as part of the International Roundtable workshop at the Annual Meeting of the National Science Teachers Association (NARST), Dallas, TX, USA. Wang, H. C., Li, T. Y., & Chang, C. Y. * (2004, December). A web-based tutoring system with styles-matching strategy for learning spatial geometry. Paper presented at the Taipei International Computer Symposium 2004, Taipei, Taiwan. Wen, M. L., Tsai, C. C., & Chang, C. Y. * (2003, December). Attitudes toward peer assessment: Perspectives from college students and inservice teachers. Paper presented at the 2003 International Conference on Computers in Education, Hong Kong. Huang, C. M., Tsai, C. C., & Chang, C. Y. * (2003, March). Sixth graders’ cognitive structures about the concepts of solar system: the role of science achievement. Paper presented at the Annual Meeting of the National Association for Research in Science Teaching, Philadephia, PA, USA. Chang, C. Y. *, & Chiu, M. H. (2000, April). Science education reform and the national science education standards in Taiwan. Paper presented as part of the symposium on: Connecting communities through research in science and technology education for all: An international perspective at the Annual Meeting of the National Association for Research in Science Teaching, New Orleans, LA, USA. Chang, C. Y. *, & Barufaldi, J. P. (1997, March). Initiating change in students' achievement and alternative frameworks through a problem solving based instructional model. Paper presented at the Annual Meeting of the National Association for Research in Science Teaching, Chicago, IL, USA. This paper was nominated for 1998 NARST Outstanding Paper Award.